Egyptian Christians have staged a protest in Cairo demanding the government uphold their rights, saying they are being treated as second-class citizens in North African country where Muslims are the majority. Sectarian violence and the regulation of church construction are some of the key issues that provoked the rare protests by Egyptian Christians at the High Court in Cairo on Aug. 13, Assyrian International News Agency reports. The rally drew a small crowd of around who chanted "Save your Coptic brothers," as they resisted security attempts to make them leave. The protestors braved Egypt's severe protests' ban at the courthouse in the capital, holding up signs, calling for their legal rights to be upheld in disputes between Muslims and Christians. "I am an Egyptian citizen above all," said Michael Armanious, a Christian demonstrator, The Associated Press reported. "We pay taxes, we serve in the army, we are dealing with all the same economic problems in Egypt with the rest of our countrymen, why should we have fewer rights?" he said, in a sea of roadblocks and police, who made the crowd disperse after an hour. Among the participants, Magda Tharwat, a member of the independent Egyptian Union for Human Rights, told Daily News Egypt that a proposed law on the construction of churches is restrictive and a source of inequality between Muslim and Christian citizens. "Why should there be a law on constructing churches and not on mosques?" Tharwat asked. "Restrictions on churches include its definition as a fenced place of worship, upon which governors have the authority to license with the obscure involvement of the National Security apparatus." Copts struggle to secure convenient places of worship, while authorities easily issue licenses for cabarets, said Tharwat. Churches are no source of "incitement to violence," she added. "We demand citizens' equality," she said. The Egyptians Against Religious Discrimination group called the rally and included both Muslims and Christians. "The past weeks witnessed a significant increase [of sectarian violence] in some governorates, especially the governorate of Minya, amid a setback in law enforcement and the negligence of the police and prosecution to protect Coptic citizens," the group said on its Facebook page. Christians account for about ten percent of Egypt's 91 million people and they sided overwhelmingly with Abdel-Fattah el-Sissi when he overthrew an Islamist president in 2013, paving his way to the presidency. Some Christians have, however, recently expressed concerns that their live have not improved under the former general, despite his promises. In the southern Egyptian village of Naj al-Nassara residents watched in horror as their Archangel Mikhail Coptic Church burned to the ground, USA Today reports. "We heard deafening sounds of explosions and crackling as the interior of the church gave way," said Salim Qamhi, a farmer in Naj al-Nassara. "The fire had eaten up everything — the wooden sanctuary, the icons, the pews and the books." The fire came mid-July came along with a series attacks that have alarmed the country's Coptic Christians. The Coptic Christians are one of the oldest Christian communities in the world. 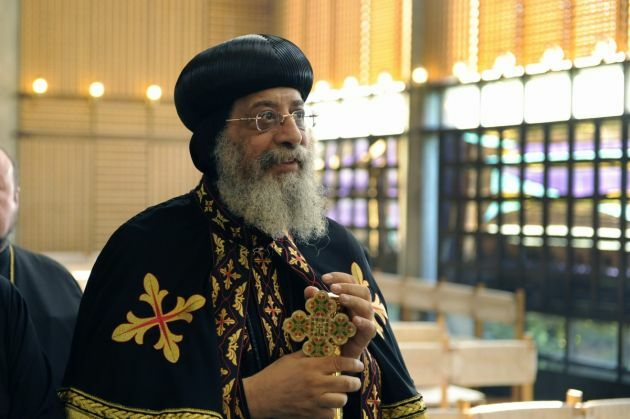 "The incidents we heard about are very painful," Egypt's Coptic Pope Tawadros II recently told an Egyptian parliamentary committee. "I'm patient and enduring, but there have been incidents that warn of danger."